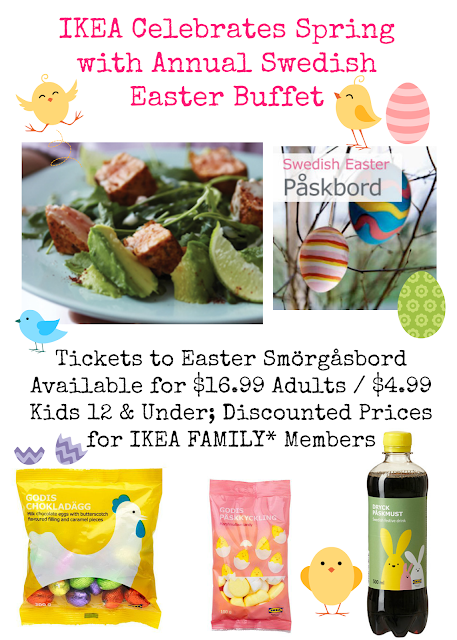 Seating is limited, so those who are interested are encouraged to purchase tickets early at their local IKEAstore. To locate and contact the nearest IKEA store for more details – including local seating times – visit the “Store Locator” page on www.IKEA-USA.com. Between Feb 21-March 2, customers who buy a ticket in the restaurant to the IKEA SWEDISH EASTER PASKBORD will get a chance to win a pair of tickets to KURIOS – A Cirque du Soleil Big Top Show. 5 winners will be selected and announced on IKEAwebsite and Twitter on March 3. Since its 1943 founding in Sweden, IKEA has offered home furnishings of good design and function at low prices so the majority of people can afford them. here are currently more than 360 IKEA stores in 47 countries, including 40 in the U.S. IKEA incorporates sustainability into day-to-day business and supports initiatives that benefit children and the environment. For more information see IKEA-USA.com,@IKEAUSANews, @IKEAUSA or IKEAUSA on Facebook, YouTube, Instagram and Pinterest.